April, 2012 | H&R Group K.K. To start with, apartments in Japan are measured in “Jo”. Jo uses the size of one tatami mat, the traditional rice straw flooring in Japanese homes, to express the size of rooms. The measurement is used for room size regardless of whether or not the room actually has tatami. 1 tatami, or 1 Jo, is equivalent to 1.53 meters square, or 5 square feet. It is not uncommon for single people in Japan to live in a one room apartment of only 12 Jo. 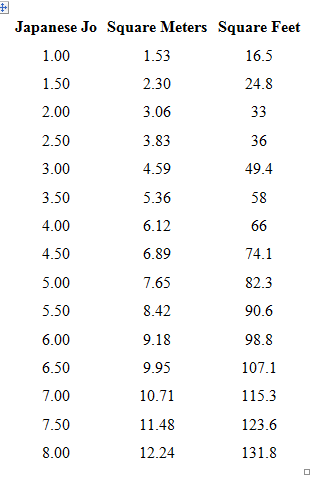 See an interactive version of this conversion table here. Generally, houses and apartments in Japan are poorly insulated, and double glazed windows are rare. You will also find that there will not be central heating in your home or building. However, in properties that do have it, expect high electricity bills and sub-par performance in comparison to western equivalents. It is more likely that each room will have a single unit device that will heat, cool, and dehumidify at the push of a button. Because of this, you will find the room you are using is set to your liking, but other rooms are unconditioned. This is do largely to the Japanese culture of efficiently using energy when heating and cooling rooms. As one can imagine, this can be particularly unpleasant in areas such as the bathroom. This has led to innovations such as the ever popular Washlet with heated seats. Of course apartments come in many sizes and they are usually expressed with descriptions such as 1LDK, 3LDK, 1K, etc. 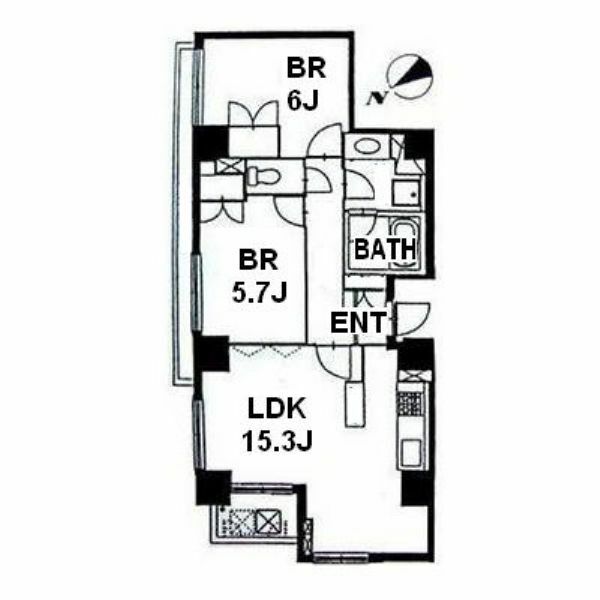 A 1 LDK apartment includes 1 bedroom, Living room, Dining room, and a Kitchen. 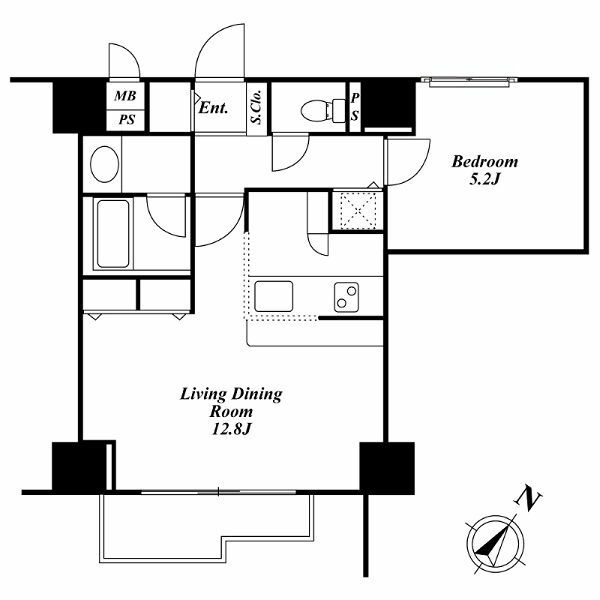 Here is a layout of a typical 1LDK apartment. It is fairly common the “L and D” occupy the same floor space. 3LDK rooms will often have at least one or more rooms with tatami flooring. My apartment is a “1 Room Mansion,” or a studio apartment. In general, pets are not permitted. While exceptions to this rule exist, you must get permission from the landlord, and then pay additional deposits or monthly fees that are usually nonrefundable. Fees could run from 3,000-10,000 yen per month or you may be required to pay around 3 months’ rent up-front; not cheap! Additionally, while some apartments will allow small dogs, very few will allow cats (apparently cats do more damage to apartments in Japan than dogs do!). Perhaps the most frustrating of the apartment rules to westerners is that BBQs are not allowed on balconies or in housing complexes. You must take it to the park! You should also be aware that in addition to cleaning fees you will be expected to pay when vacating the property, if you damage the wallpaper (for example by hanging a painting) you will be expected to pay for the entire section of wallpaper to be replaced after you move out. Rent and key money has been dealt with in a different article, so I will not go into detail on the subject here. Please follow this link to see more on that topic. A few words on Japanese appliances; the first thing you need to know is, there will be nothing in the apartment when you move in; not even light fixtures. You will be buying a great deal of stuff when you first move in so make sure to set aside some time and cash for shopping. When you do start buying things, you should be aware of a few difference in appliances that you might not be used to coming from your home country. For example, Japanese washing machines only wash with cold water (click here for the article on washing clothes in Japan). Japanese clothes dryers are often combination machines and take hours to dry clothes fully, therefore most people dry their clothes on a line outside. In the kitchen, you will find things are a bit different. Ovens are usually a microwave/standard oven combination, and are too small to roast any large meats. A large amount of people just get by with a toaster oven in their apartments, as even a smaller “full size” oven will struggle to perform at the same level as a gas burning one. One item you may find that I have never seen outside of Japan is a fish grill. Many gas stove ranges come with a small drawer-like section below the burners for broiling fish. They work great, but don’t forget to add water to the bottom of the tray to keep things from getting to smokey! A really nice, modern apartment will have an IH (Induction Heating) cooking stove which will require special conductive cookware. Luckily, these products are easy to find as the IH stoves are growing in popularity for their low risk of creating oil fires! What is an IH Stove? In the bathroom you will find the above mentioned heated toilet seats, if you are lucky! These modern toilets will often have a wash-let/ bidet function, and not only the toilet seat, but the bidet water as well can be heated. It might sound odd to you to use one of these, but I promise, you will never go back! Showers and baths can be very different depending on the size of the apartment. The usual 1K studio apartment will have a small combined toilet shower room, similar to what you might find at a Japanese business hotel. larger apartments will have separate bath and toilet facilities, and the largest yet will have a shower area beside the tub with a completely waterproof room and built in steam spa. Higher-end baths can be filled automatically, re-heated, and used again by other family members all from the push of a button and often from the kitchen. Before using a bath shared by others, Japanese families shower before entering the bath which is why it shares the space with the tub. Additionally, shower heads in Japan are of the type you can pull off the wall, rather than those that are permanently attached. My understanding is that Japanese people use the shower sitting down as a matter of habit, so expect to have to duck under if you intend to stand while showering. If you have any questions about Japanese Apartments feel free to ask them in the comments section below, or better yet, you can join the conversation on the JIS page in Facebook, where the conversation is already in progress! There are a million other things that could be covered by this article, but this will get you started on the road to a new place. If you are interested in seeing available, foreign friendly properties, please take a look at www.japanhomesearch.com. They have thousands of available properties, and the best service in Japan. Good luck!